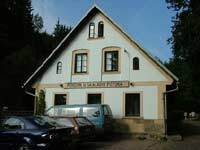 Accommodation close to the Adrspach-Teplice rocks. 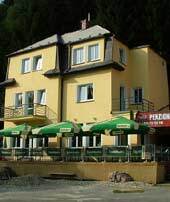 There’s really a wide choice of accommodation close to the Adršpach-Teplice rocks, and most of it is quite good value. There are clusters of accommodation in three or four different places around the edge of the park. In Teplice itself, there are ample hotels and pensions, there are several pensions alongside the road that runs from there to the park entrance and another four or five are grouped around the actual entrance to the park, which is about 2km north of the town centre. 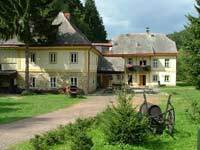 The other main area for accommodation is up in Adršpach at the northern end of the park and close to the more famous rock formations there. 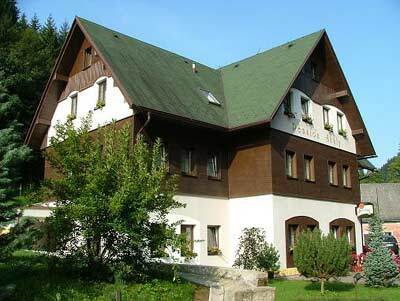 In Teplice nad Metuji you can choose from such places as Hotel Sokol, Pension Rybarna and Pension Kamenný Mlyn. Pension Rybarna was advertising accommodation from 250Kč per person in August, and if it’s anything like it’s restaurant on the ground floor, it’s probably quite well run. Just across the street from there is Kamenný Mlyn. From these places it’s about 3km to the nearest park entrance, so perhaps they’re most suitable for travellers on bicycles or with some other form of transport. Unless you really have a lot of time and not much money, Id have to suggest that it’s probably worth paying a little more and staying a bit closer to the park entrance. Which brings us to the hotels and pensions around the entrance (to the Teplice rocks). Hotel Orlik seems to be the most prominent of these. If you arrive by train at Teplice nad Metují-skály this will be the first building you see as you approach the park entrance. They offer rooms from 450Kč. Next around the carpark is Pension pod Ozvěnou, the big white building with the fast food canteen on the ground floor. Pension Severka seems to be the newest outfit and, like the Hotel Orlik, its restaurant has a pleasant enough balcony with an unfortunate view of only the carpark. There are also several pensions beside the road from Teplice to the park entrance (the same road continues north to Adršpach). A pleasantly burbling stream runs parallel to the road, and you’re surrounded by thick forest. While you may not escape traffic noise Pension Skály is closest to the park entrance and has a nice looking restaurant with Pilsner on tap. Next along is Pension Tara, a family run place with a small souvenir store and a breakfast room only for its guests. Pension Ctyřlístek (four-leaf clover) might appeal to the homesick Irish Traveller. Up at the Adršpach end of the park, I really liked the look of Pension Skalní Mlyn. It’s a restored mill a little outside town in a beautiful setting, there’s a nice terrace out front, it’s set a good distance back from the road and its prices are more akin to those around Teplice than the flashy pensions in Adršpach. Some of the Pensions in Adršpach seem to have been built with mass tourism in mind. Pension Adršpach doesn’t have much of a garden but at least offers good views over the small valley. I collected this information during a visit to the rocks in August 2007, but these things are always subject to change so please take what you read here as a guide and make your own enquiries if necessary.